Bio-Linux 8 comes with a tutorial document suitable for complete beginners to Linux, though some basic bioinformatics knowledge (eg. what is a read, assembly, feature, translation) is assumed. The tutorial comprises a general introduction to the Linux system and a set of exercises exploring specific bioinformatics tools. You can find the latest version of the tutorial via the Bio-Linux documentation icon on the desktop. There is also a copy on-line. Allow yourself around 2 days to work through this, depending on your previous experience. 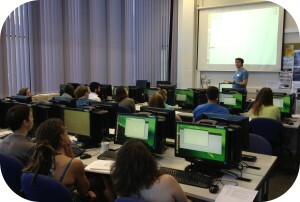 The Bio-Linux developers periodically teach courses around the UK, based upon the tutorial. If you would like us to run a course at your institute please get in touch. A list of previous courses and related material can be found on the old training page. Several people have either taught our Bio-Linux material or used Bio-Linux as a training platform for their own courses. Here are some recent examples. Simon Creer (Bangor) used Bio-Linux to teach a QIIME practical session in June 2015 at a Roscoff marine summer school. Ian Donaldson (Manchester) prepared customised OVA images for tutorials on ChIP-seq using Galaxy. Michael Cox (Imperial) uses Bio-Linux for teaching practicals on QIIME and R.
Note that Tony Travis can provide training and other Bio-Linux consultancy on a commercial basis, so if you are interested in this please get in touch with him directly.